Was it Nominal or Real? HomeBusinessWas it Nominal or Real? Scott Sumner has been arguing for some time that the current recession mutated from a mild downturn in early 2008 to a sharp contraction in late 2008 and early 2009 because of a nominal shock, not a real one. Specifically, he has been making the case that monetary policy effectively tightened in late 2008 and, as a result, nominal spending collapsed and pulled down an already weakened economy. According to this view, real shocks like the one coming from the financial crisis or the spike in oil prices, which were important in starting the recession, cannot explain the severity of the downturn that began in late 2008. As readers of this blog know, I have been sympathetic to this view as can be seen here and here. Many observers, however, do not buy it or if they do find it plausible refuse to endorse it due to the lack of empirical evidence. 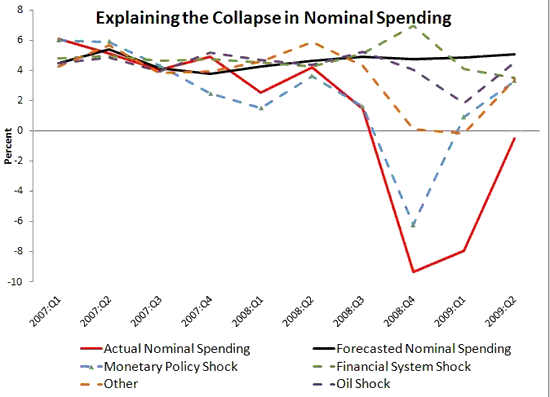 This post is my attempt to shed some light on this debate by using some rigorous (albeit imperfect) empirical methods to tease out what shocks drove the collapse in nominal spending. This essay is in some ways an extension of what I did earlier this week, but it is motivated more by the need for empirical evidence. I won’t claim it is conclusive, but it is a start. 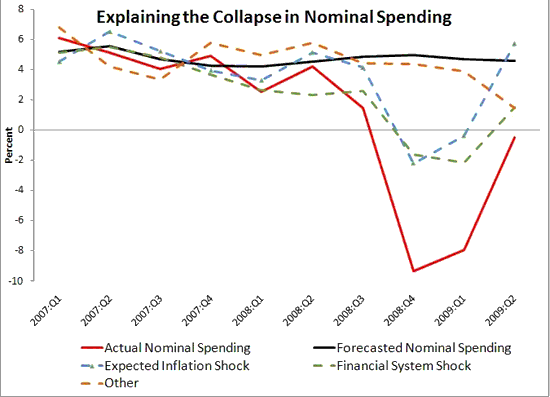 In order to uncover the shocks that drove the collapse in nominal spending, I turned to a vector autoregression that as a base line model included expected future inflation, nominal spending, and spreads on corporates yields. The expected future inflation data comes from the Philadelphia Fed’s survey of economic forecasters, nominal spending is final sales to domestic purchasers, and corporate spreads are the difference between the yield on BAA and AAA corporate bonds. The reasons for using these variables is as follows. First, Scott has been arguing that the collapse of expected future inflation in late 2008 reflected an effective tightening of monetary policy that translated into reduction of current nominal spending. In other words, the market saw deflationary pressures on the horizon and immediately cut back on spending. Second, the corporate spreads provide a convenient measure of the financial crisis and should control for any collapse in nominal spending coming from a negative financial shock. The data for these variables run from 1971:Q1 thru 2009:Q2. Here the expected inflation shock is still important, but now only explains at most 31% of the decline in nominal spending. 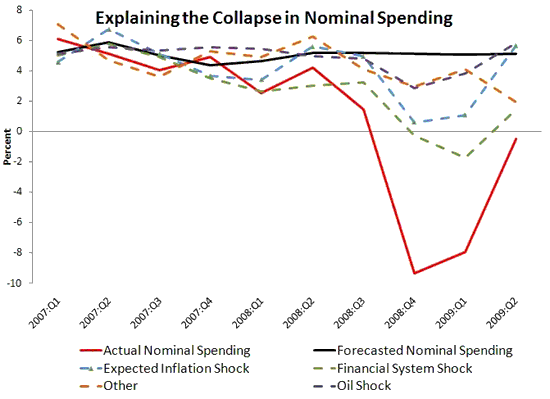 The financial shock becomes more important and oil itself is non-trivial in explaining the decline in nominal spending. *The VAR had 5 lags to remove serial correlations and the variables were all in rate form so no unit root problem. Is the Great Recession Grinch Coming to Australia?